Former Wet Wet Wet singer Marti Pellow has announced he is extending his run in the hit musical, Blood Brothers. Marti has been playing the part of the narrator since 1st November 2011 and was originally due to finish his run in the smash-hit Willy Russell musical in a couple of week’s time on 3rd March, but he has extended his run until 28th April 2012, much to the delight of his fans. Blood Brothers currently shows at the Phoenix Theatre in London, where it has been playing to packed audiences for over twenty years, since 1991. The tragic and touching tale tells of twin brothers, separated at birth, brought up in different classes who are ultimately reunited. Songs from the score of the musical, also written by Willy Russell, include ‘Marilyn Monroe’, ‘A Bright New Day’ and the emotional finale, ‘Tell Me It’s Not True’. Blood Brothers is currently taking bookings until 24th November 2012. What do you make of this news? Are you pleased for Marti or do you think that it’s time someone else took over as the narrator? Have your say in the comments box below! Saw Blood Brothers yesterday 21/2/12. What a fantastic show the whole cast were great but as a fan Marti Pellow was fantastic!! He was the reason I came to see the show in the first place but enjoyed the whole performance! What a show!!!!! Brilliant news – My wife wants to see him and I was planning a 50th birthday surprise in April. Was disappointed to see he was finishing on 3rd March and was going to leave it until I saw this. I was really pleased when I heard he had extended his run as I wanted to come and see him with my friend, but couldn’t get there before the end of feb. Going to see him fri 27th now, so really excited. Excellent performance from all the actors, actresses, orchestra and the entire background team.. If I had recognized earlier that the narrator was Marti Pellow -one of my fav band’s singer during my 20’s-, it would add even a greater taste to me. Thank you all ! Have to say he was truely amazing as the Narrator/Devil in Blood Brothers…He has such a powerful voice, and he is so easy on the eye! 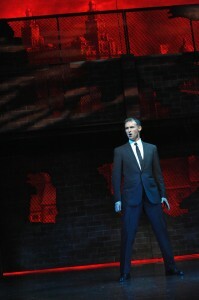 My hubby and I saw Blood Brothers at the Phoenix theatre, last Wednesday 4th April. OMG! Marti Pellow was outstanding as the narrator/devil. His voice was/is soooooo so powerful. The entire show was fantastic and moved me to tears twice. It was an excellent performance by all the cast, Mickey especially as he was able to play a child/teen/adult with such conviction. Our entire family have seen the play over the years and our 15yr old daughter saw it in November 11 and she too loved Mickey the most. Ive always loved the gorgeous Marti Pellow as i was an avid Wet Wet Wet fan so to discover he was in the play was a massive bonus. I will deffinitely be seeing the play again. My daughter and I went along this week and what a time we had. The cast were all truly amazing, Marti’s voice was, as usual, excellent. One minute you’re laughing out loud and the next close to, or actually, in tears as you follow the brothers’ tragic journey. A must see musical. Just seen Blood Brothers for the third time (matinee 21/04/12) and thoroughly enjoyed each performance (Nov2010 and touring version Mar2010) but this evenings was the best yet. The whole cast was fantastic and Marti Pellow was superb as the narrator, great voice and captured the sinister nature of the part perfectly. I’ve seen the show a number of times over the last fourteen years and hailing from the North West, it has a very dear place in my heart. So when I see a performance that’s below par, I really notice it. Marti was a very poor narrator in my opinion. I loved him in Wet Wet Wet don’t get me wrong. But he was melodramatic, his accent was atrocious, not sure what accent he was trying to do but it was terrible and it really ruined the show for me. Can’t wait for a new narrator to come in. Fourth time ive seen it and Marti was fantastic reminded me of the grim reaper. Fabulous singing voice I wished they had invited him to sing in the jubilee concert instead of some of the tuneless performer they had some past their sell by date. Would see it again, Well done Marti and the other actors. I went to see Blood Brothers last night in Glasgow, I have been a Marti Pellow fan since I was a teenager. I went along with my Auntie who is visiting from Australia we loved the show and especially Marti as always he brought a smile to our faces. Marti played a great part as the Narrator and his voice is second to none. Well done loved it!! Marti gave a fantastic performance, as did all of the cast. Thank you all for a fantastic evening. Just home from seeing Blood Brothers at His Majesty’s in Aberdeen. Brilliant show! Marti did a fabulous job – the fella has an amazing set of pipes on him, that’s for sure! He struggled to hold the accent sometimes but still very impressive, as were the rest of the cast. Can’t wait to see the show again, although I won’t make the mistake of sitting in the balcony again!! !